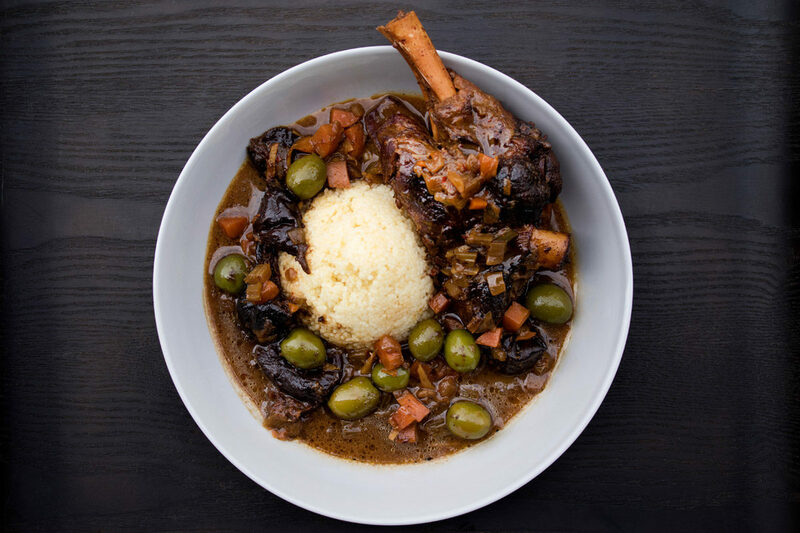 These unctuous lamb shanks are slow-braised in a spiced broth of beef stock, wine, ginger, and olives until luxuriously tender. If you want, they can be braised a day ahead (and will be even better if you do so), then chilled overnight & reheated in time for your dinner. Grind the bay leaves, cardamom pods, and salt together in a spice grinder or cleaned coffee grinder. Once they’re finely ground, add them to the other spice blend ingredients. Rub the lamb shanks with the spice blend. Sear them in a hot, oiled frying pan or cast iron skillet until browned on all sides. Reserve any spice rub that falls off them on the way to the pan. Remove the shanks from the pan & put them in a deep stock pot. Add the onion, celery, and carrot to the frying pan along with any of the spice rub that’s left over. Sauté them in the residual lamb fat for 10 minutes. Add the ginger, prunes, olives, Aleppo pepper, preserved lemon & vermouth. Scrape the browned bits off the bottom of the pan. Add the vermouth mixture to the stock pot with the shanks along with the beef stock and water. Put the stock pot on the stove & heat it until the liquid comes to a boil. Move the pot to the oven (uncovered) and braise until the shanks are tender (3-4 hours). Optional: Remove the shanks from the braising liquid. Store them and the liquid in your fridge overnight for serving the next day. Skim the fat off the surface of the braising liquid. Optional: If you took the shanks out of the liquid for overnight storage, return them to the liquid. Reheat the shanks & liquid on the stove until quite hot. 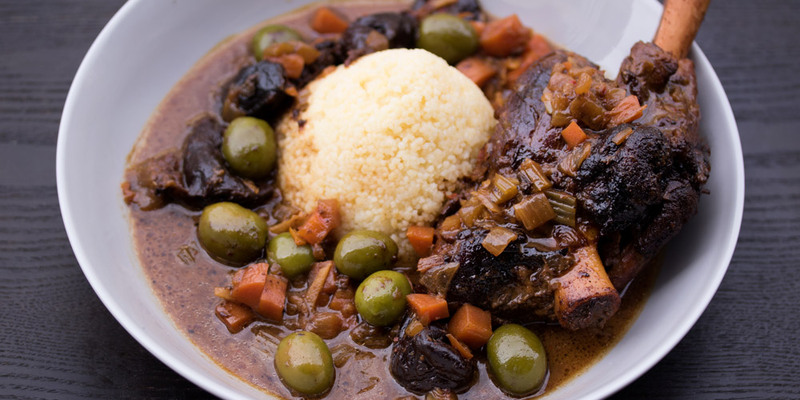 Serve the shanks with you choice of starch (we recommend couscous), drizzled with the braising liquid as a sauce.